​Manchester City maintained their top spot in the Women's Super League last weekend, with a comfortable win over 3-0 Brighton & Hove Albion keeping their unbeaten run going. Elsewhere though, Chelsea lost precious ground in the title race after losing a 3-2 thriller to Birmingham, while Arsenal kept their dreams of winning the trophy alive with a 3-0 win away to Reading. ​City were at their clinical best against Brighton, with a brace from Nikita Parris and a close-range finish from Gemma Bonner giving Nick Cushing's side an unassailable, three goal lead after just forty minutes. England captain Steph Houghton almost made it four in the second half, but saw her free kick curl agonisingly wide of the post. We sit one point clear at the top of the #FAWSL table  Ohhhhh yeahhhhhh! 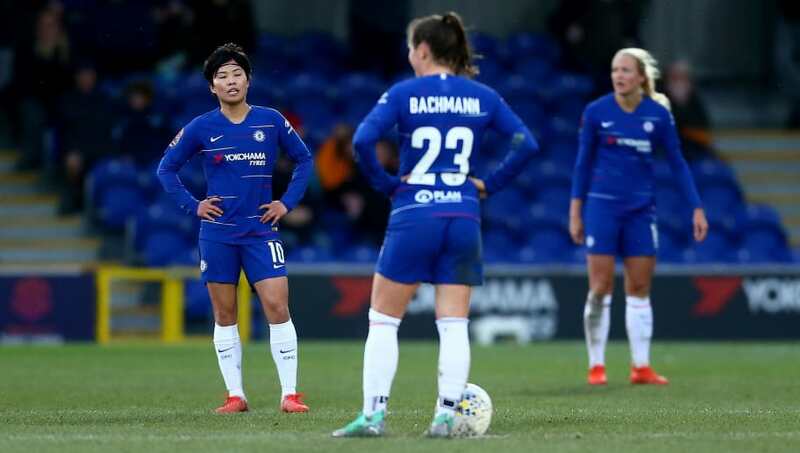 The most dramatic action of the day was to be found at Kingsmeadow, where champions ​Chelsea dropped vital points against Birmingham. It appeared to be business as usual when Erin Cuthburt's diving header gave the hosts a 1-0 lead early on, but the visitors hit back before the break as Emma Follis stabbed home the equaliser. City went ahead via an audacious Lucy Quinn lob midway through the second half, before Cuthburt levelled the scores with her second goal of the match. In the depths of stoppage time, Marc Skinner's side stole a famous with, as England ace Ellen White looped home a stunning volley to the delight of the travelling supporters. Over at Adams Park, Reading were beaten by ​Arsenal, who kept their title hopes alive with an important win. WSL top scorer Vivianne Miedema's deflected effort gave the Gunners the lead after two minutes, but left it late on to assure their win. Reading's poor finishing let them down, as Kim Little's 80th minute penalty and an arching strike from Katie McCabe sealed their fate. Miedema's strike was her 16th league goal of the season – a WSL record, reached with a staggering seven games remaining in the campaign. Meanwhile, Bristol City came from behind to triumph 2-1 against bottom of the table Yeovil Town. After a fiercely fought first half, Veteran forward Annie Heatherson gave put the visitors in front shortly after the break. However, the home side rallied, with Lucy Graham's penalty and Rosella Ayane's 72nd minute strike stretching their unbeaten run to four matches. The next full round of fixtures will see a fascinating matchup between Manchester City and Chelsea, while Arsenal, who have a one game advantage over the Citizens, will hope to emerge victorious from a trip to mid-table side ​Liverpool. ​For a full roundup from the weekend's action in the second tier Women's Championship, including how league leaders Tottenham got on, click here.